River otters dive to depths of at least 60 feet (18 m) and can stay submerged for more than four minutes. The North American river otter is a thickset mammal with short legs, a neck no smaller than its head, inconspicuous ears, and a muscular body that is broadest at the hips. Its tail is powerful and a little more than a third as long as its head and body. Only the hind feet are webbed. Adults weigh 15 to 35 pounds (6.8–15 kg) and are 40 to 60 inches (102–152 cm) in length. On the average, females are about 25 percent smaller than males. It is sometimes called the land otter (to distinguish from the sea otter). River otters appear to have well-developed senses of smell and hearing. Their vision is not especially good but may be better underwater than above. Several sets of strong whiskers are used by the animal for hunting and avoiding obstructions. River otters in Alaska breed in spring, usually in May. Mating can take place in or out of the water. One to six pups (usually two or three) are born the next year any time from late January to June following a gestation period of nine to 13 months. Delayed implantation (a period of arrested embryonic growth) accounts for this variation in the length of gestation. The pups are born toothless and blind in a den that is usually a subterranean burrow. Their eyes open seven weeks later. When about two months old, they begin to leave the den and shortly thereafter start to swim and eat solid food. They are taught to swim by the female who must coax or drag them into the water. Pups are weaned when about five months old. They will stay with their mother until shortly before her next litter is born. River otters are sexually mature when they are two years old. A female will then mate with the male of her choice and produce one litter each year. Otters can live and breed for more than 20 years. 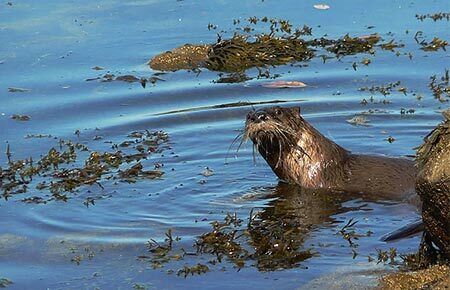 River otters in Alaska hunt on land and in fresh and salt water eating snails, mussels, clams, sea urchins, insects, crabs, shrimp, octopi, frogs, a variety of fish, and occasionally birds, mammals, and vegetable matter. Aquatic organisms no bigger than a man's finger are usually eaten at the surface of the water, while larger food is taken ashore. Otters are graceful swimmers and propel themselves in the water by paddling or vertically flexing their hindquarters and thick tails. They can swim at about six miles per hour and can go faster for short distances by “porpoising” along the surface. River otters dive to depths of at least 60 feet (18 m) and can stay submerged for more than four minutes. They can run as fast as a man and on hard snow or ice reach speeds of more than 15 miles per hour (24 km/hr) by alternately running and sliding. River otters produce a variety of noises. They growl, caterwaul, and whine. When alarmed, individuals emit an explosive “hah!” When two or more are together, they often produce a mumbling noise that seems to be a form of conversation. A good imitation of this is made by closing the lips and rapidly uttering “hm” several times in a deep voice. A bird-like chirp apparently expresses anxiety and is most often heard when members of a group become separated. The North American river otter ranges over most of North America north of Mexico. 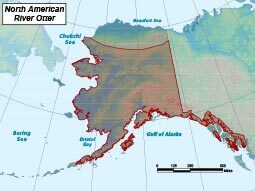 The river otter is found throughout Alaska with the exception of the Aleutian Islands, the offshore islands of the Bering Sea, and the area adjacent to the arctic coast east of Point Lay. River otters have no significant predators except man, and are occasionally killed unintentionally when they become entangled in fish nets or trapped in crab pots. The river otter’s primary threats include habitat harvest and degradation. They are highly susceptible to pollution such as oil contamination by accumulation of certain compounds due to their position at the top of the food chain. Throughout Alaska with the exception of the Aleutian Islands, the offshore islands of the Bering Sea, and the area adjacent to the arctic coast east of Point Lay. A variety of marine and terrestrial invertebrates, frogs, a variety of fish, and occasionally birds, mammals, and vegetable matter. Breed annually; females give birth to one to six pups after a nine-to-thirteen-month gestation period.